Keeping your rabbit healthy is the goal of anyone taking care of rabbits. Understanding bunny health helps! 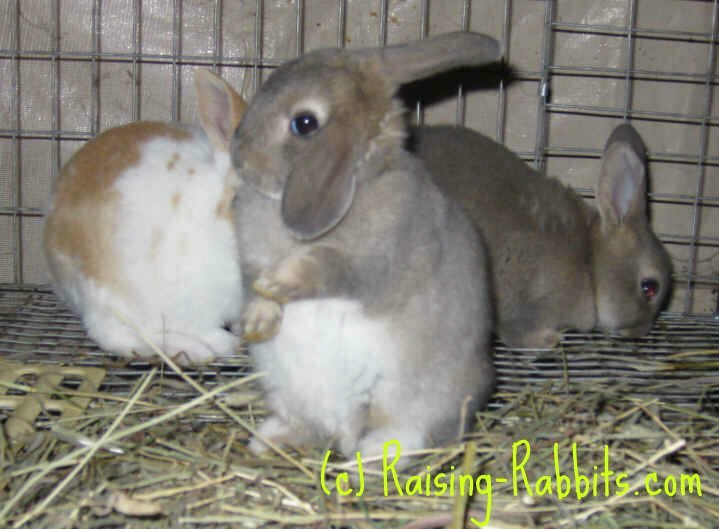 This page will help provide that understanding, so you will know how best to take care of your rabbits. are three of the most important factors of disease control. Plus, add to that the quarantine of new additions to your rabbitry or home, and breeding for health by NOT using sick animals for breeding. These measures will help keep your herd healthy. Ventilation helps keep the air in the rabbitry or barn clean. Ventilation dilutes the concentration of microbes (of various types) in the air, and for this reason is extremely important factor in rabbit health. Plus, good ventilation keeps the ammonia levels down. If you open the door to your rabbitry and get hit with a dank wall of urine odor, your rabbits' lungs are burning as well. Rabbit urine creates clouds of ammonia, which irritate the linings of the rabbits' lungs. This creates wounds that positively invite infections such as pasteurella (snuffles). The best way to alleviate the ammonia is to remove waste materials regularly, and to ensure a minimum of about 15 air exchanges in an hour. This can be accomplished with an exhaust fan that pulls the air out of the building, and creating an inlet of fresh cool air, usually near to the ground. Sanitation is another method of keeping rabbit health strong. Sanitation? Simple - just keep the cages clean. A single rabbit hair can carry thousands of bacteria or viruses. This doesn't need to frighten you...it’s the job of the animal’s immune system to keep it healthy and protected from illness. It's worked all these years. But, wild rabbits can manage their own environment. Once you confine the rabbit to a cage, it needs you to help them keep the cage clean. This isn't to say you must sterilize the entire barn. It just means keep the cage clean - to reduce the numbers of germs the rabbit comes in contact with. This one factor alone can be the determining factor for whether or not the animal catches a rabbit illness. Suppose your rabbit sniffs one of those stray hairs and gets 1,052 germs in his nose. There’s a great chance the immune system will kill the germs and the rabbit will stay healthy. But if the rabbit sticks his nose into a million germs all at once, say, a build-up of feces in a cage corner, well, his immune system might call up all the troops, and still lose the battle. Sanitation evens the playing field and gives your rabbit a chance to stay healthy. Observation is another important key to rabbit health. Just be paying attention every day to how your rabbit might be feeling. Even at Aurora Rex Rabbit Ranch, where we have close to 50 adult rabbits, it takes just a few minutes to say ‘hello’ to each rabbit, observe their demeanor and behavior, and maybe open the cage and pet the rabbits. We observe that the rabbit’s water valve is working well, that its droppings are round and solid and normally formed, and that the rabbit is bright-eyed and energetic. I know which rabbits spin around the cage three times in their eagerness to say hello. I know which are normally a little more timid. 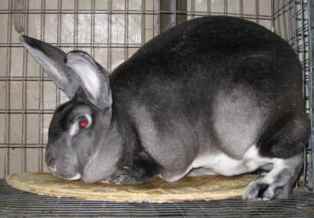 The chinchilla Rex rabbit pictured here is hunkered in the corner of her cage. But she's my best friend when I come with the food cart. Look how well-conditioned she is. No worries there. When rabbits start feeling not-so-hot, it's not like they make a general announcement. But you can see it in other ways: They quit eating or drinking. They might sit hunched up, as though their belly or their feet were in pain. They might have a hanging head or dull eyes. If you can catch the problem before those million germs have turned themselves into a billion and completely overwhelmed the rabbit's immune system, you might yet win the rabbit health battle. 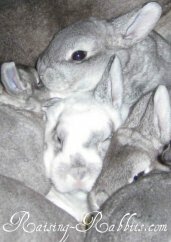 Go to our Rabbit Diseases page if you have some current rabbit health concerns. 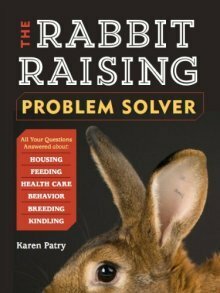 Please note: We at Raising-Rabbits.com are NOT veterinarians, and nothing said on these pages should be taken as a substitute for professional veterinarian care, should you need it. We are speaking out of many years of experience, but we truly don't know for sure what specific problems your rabbit might be experiencing. We hope you can profit from our experience, but please don't delay to seek professional rabbit health care if necessary. You’ve taken some rabbits to a rabbit show where they were around hundreds of other rabbits. And especially if several rabbits in your breed were removed from the show table for having pasteurellosis (evidenced by a purulent nasal discharge - white snot). Quarantine means to house the rabbit well apart from your other rabbits. It also means to take care of all your healthy animals first, saving the sick ones for last. Don't return to care for the well rabbits until you've changed your clothes and washed your hands well. Quarantine shouldn't need to last more than two to four weeks. We have several cages set up outside our main ‘barn’ area. Any rabbits who have questionable health get moved to these cages. We’re happy to report that these cages are mainly empty most of the time. This is what happens when rabbit health is a focus of selective breeding, and will be true of your rabbit herd too. Another method of quarantining that isn't as secure is to simply put barriers around a rabbit cage. You could call this a rabbit isolation cage, and we have quite a few of them at Aurora Rex Rabbits. We hang clear plastic panels on both sides of the cage. The back of the cage is quite close to the barn canopy, and the top of the cage usually has hay or a wooden panel laying over the cage. This helps stop the spread of germs through means of droplets, and has worked quite well for us. Catch symptoms and implement quarantine measures early, and you may just save the life of your rabbit and the lives of its herd-mates. Sick animals don't help anyone. They just drain the money out of your wallet, and out of the wallets of anyone unfortunate enough to mistakenly acquire a sick rabbit. So, don’t use ANY sick or unthrifty animals in your breeding program, no matter how attractive they may seem. By following this guideline carefully ourselves, we now have an entire herd of rabbits that are healthy all the time. There's another big reason is this important. There are a few rabbit illnesses that are virtually incurable. BUT: if your rabbit's immune system is genetically strong, and with attention to ventilation, sanitation, observation, and quarantine as necessary, chances are the vast majority of your rabbits will remain healthy into old age.